//If you happened to be at the Hi-Rez 2018 Expo, then you were lucky enough to get the first glimpse at Paladins. This was a really fun project that everyone in the studio wanted to work on. If you haven't checked it out yet, you are definitely missing out! 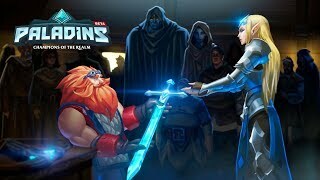 A Realm Divided is Paladins’ first lore cinematic to go into detail about the game’s world and characters. This is the first piece of media to introduce the founding Champions Valera and Karne to players. Their feats and leadership hundreds of years ago gave rise to the vying factions, the Magistrate, and Paladins, that clash in the game today. Paladins is now available for PC Gaming, XBox, and PlayStation!